Last major update issued on April 29, 2008 at 04:15 UTC. The geomagnetic field was quiet to unsettled on April 28. Solar wind speed ranged between 400 and 483 km/s. Solar flux measured at 20h UTC on 2.8 GHz was 68.5. The planetary A index was 11 (STAR Ap - based on the mean of three hour interval ap indices: 11.4). Three hour interval K indices: 21233333 (planetary), 21333333 (Boulder). 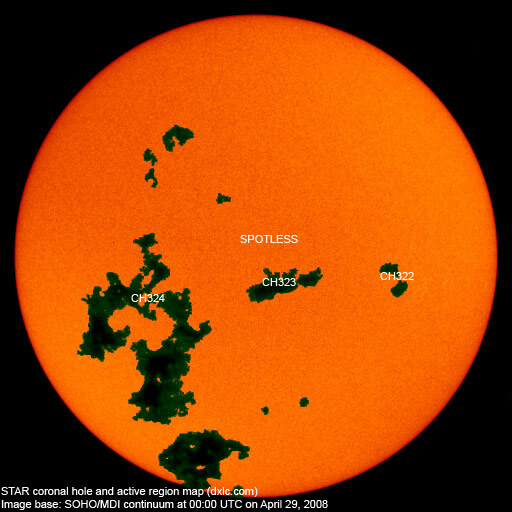 April 27-28: No partially or fully Earth directed CMEs were observed. What used to be recurrent coronal hole (CH319) has decayed quickly over the last solar rotation and broken into smaller coronal holes. 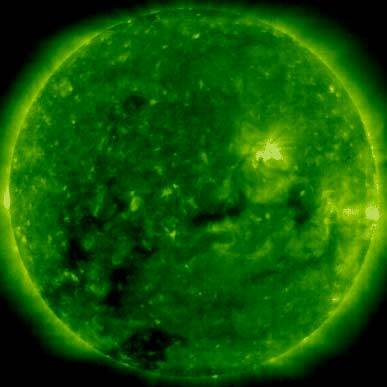 Two small coronal holes in the southern hemisphere (CH322 and CH323) were or will be in Earth facing positions on April 26 and April 28-29 respectively. The eastern part of CH319 is now CH324. CH324 will be Earth facing on April 30 and May 1. Processed SOHO/EIT 195 image at 00:24 UTC on April 29. The darkest areas on the solar disk are likely coronal holes. The geomagnetic field is expected to be quiet on April 28. 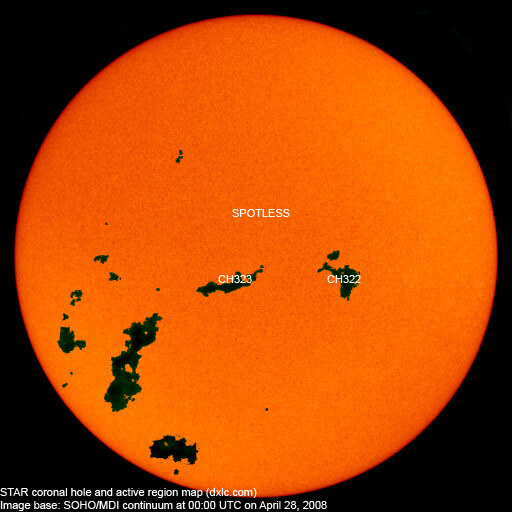 A CME observed on April 26 could cause unsettled to active conditions during the latter half of April 29. Weak effects from CH322 are possible on April 30 and from CH323 on May 1-2 while CH324 could cause unsettled to active conditions on May 3-4.